"The Quitter" depicts me smoking my last cigarette before attempting to quit. It was shot in two parts (both on Super-8 film), half in 1999 and half in 2005. 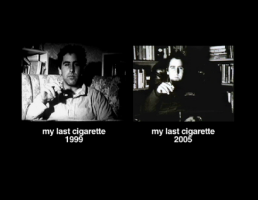 Like many people who attempt to quit smoking, I have had many "last" cigarettes. Both films (1999 & 2005) are shown simultaneously and are accompanied by a musical score by composer Nils d'Aulaire.